So what would I do once I receive my cheque? Well, of course, my priorities would be my studies, so it would go into my university fund. It's not much, but it's something =D As I come from a mediocre wealth family, can't say that $$ is easy to come by, but I know that my parents are doing their best, and it's only fair that as their daughter, I should help in any way to help them reduce their financial burden. =) After all, I have one more little sister in Form 5 now, and she will be heading off to uni soon (if she doesn't go F6 lar). 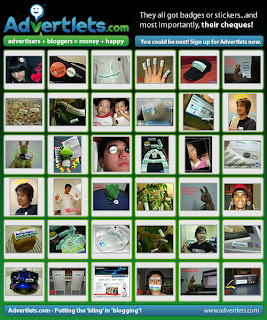 Of course, any Advertlets user can participate in this opportunity, provided that you haven't cashed out from Advertlets previously ^_^ Once again, thanks to Advertlets for creating another opportunity for us bloggers to earn more $$! Hopefully in the future there will be more opportunities like this for us, and more future versions of catscity cliques for us here in East Malaysia.